Micrographia: or, Some Physiological Descriptions of Minute Bodies made by Magnifying Glasses. With Observations and Inquiries Thereupon. London: Printed by J. Martyn and J. Allestry, 1665. Hooke's Micrographia was one of two publications authorized by the newly-established Royal Society of London, and thus an inaugural scientific communication in a long line of ground-breaking research. Before beginning publication of its most well-known journal, the Philosophical Transactions, the Society also sanctioned publication of John Evelyn's Silva in 1664. 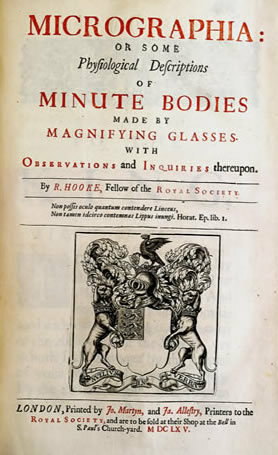 Hooke was appointed the Royal Society's first Curator of Experiments in 1662, by which time he already had an established reputation for scientific research. The present text contains not only Hooke's observations on biological specimens seen through the microscope, but also writings on combustion.